This is the “I can’t quit you salad” for me!! Seriously, I couldn’t stop. Refreshing, flavorful, beautiful and filing!! 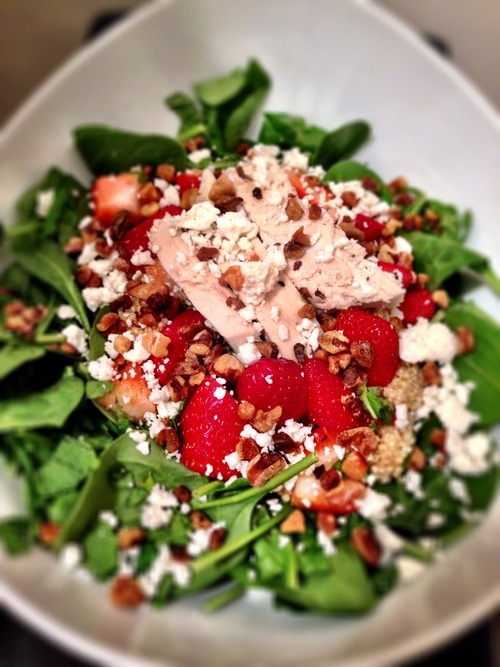 Spring is around the corner and this fresh salad is the perfect way to ring it in one evening. I also served the dressing on the side then ate leftovers the next day – SO good. The homemade dressing is ah-mazing. I mean, you could make that and keep a bottle in the fridge for other salads… just a thought. 🙂 I hope you enjoy this one! This is yet another one I took from the amazing Love and Lemons food blog. Cook your quinoa. I like this method. Toss all salad ingredients together and pour on the dressing. Taste and adjust seasonings to your liking. I added a final squeeze of lemon juice and a drizzle of olive oil on top. This is the kind of salad that gets better as it sits and the flavors mesh together… so if you have the patience, let it chill for 15-20 minutes before serving. Make extra if you want leftovers for lunch the next day.